When promoting the MVP Program, use these timely tools and follow these tips to have the biggest impact on your members. Add the icon to your website, e-newsletters, and print promotions—and help spread the word to your members. Add the banner ad to your homepage and help promote the valuable program to your members. Download our fact sheet on the MVP Program (PDF: 1.65 MB) to share with members. Also, here are a few examples of simple language you can use to promote your participation in the MVP Program. The MVP icon should accompany the language below. 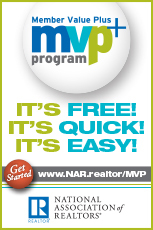 Learn how YOU can take advantage of the VALUE of NAR programs PLUS get rewarded! Learn about the Member Value Plus (MVP) Program and how you can get rewarded for taking action and participating in your Association. Show your members this step-by-step video on how they can participate in the MVP Program. In "Get Your Reward Through the MVP Program," NAR's Bill Armstrong and Bob Goldberg walk through why the program was started and how members can earn a reward every two weeks.